After upgrading to Ubuntu 13.04, I was facing this problem. I was not able to execute any script file just by double clicking on it, even though it has execute permission. Then I figured out, how to fix this problem. I opened the file explorer Files. Pressed Alt+F10 and selected Preferences. It showed something like this. In the Behavior tab, I selected Ask each time and closed it. By default, it was in View executable text files when they are opened. Now whenever I double click on a shell script, it will ask me what to do. 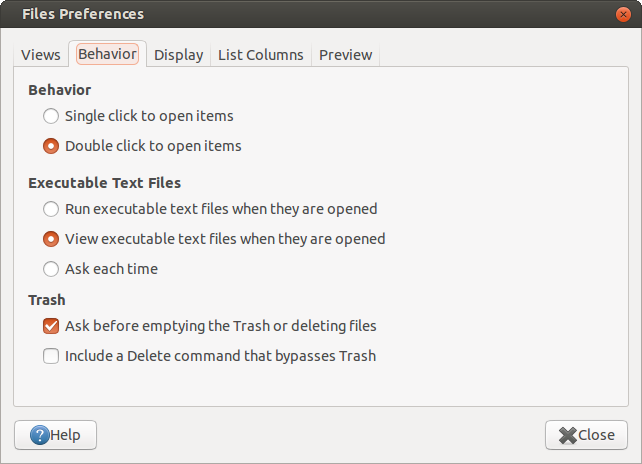 If you want to straight away execute the script, select the first option Run executable text files when they are opened. Last week, I had to make some changes to the code. I was keep on making changes but forgot to add them to git and to take backup. When I am almost done I wanted to commit and before committing I checked the changed files with this. That's it. This cleared everything, including my newly added untracked files and all my hardwork went in vain. Then I read about git clean here and got to know what I could have done to avoid this problem. And then I was thinking, if there is a script which would remind me that, the following files will also be removed and only when I say `yes` it would go ahead and clean the repository. So I made this gitclean script. This would collect the status of the files with git status --porcelain and then compare it with the list of extensions specified in the config file. If they match, it would report to the user and ask his consent before beginning to clean. Users can specify the extensions, gitclean has to report in the $HOME/.gitclean_extenstions file. By default, gitclean will report the extension-less files and directories as well. But, it does not report the empty directory. My .gitclean_extenstions file has the following items. Unarguably Sublime is one of the best text editors and with its ability to extend with python scripts, gifts itself a lot of power. Here lets see one of those extensions which allow code completion. Normally, sublime provides code completion for the words in the current file being edited. Codeintel allows the user to get code completion feature of the respective languages. After installing it, Press Shift+Ctrl+P or click on Tools->Command Palette. In the window that opens up, type Install Package. In the text box which you see after that, type SublimeCodeIntel and click on it to install it. You are done with the installation of CodeIntel. The following information is taken from the README.rst file. Open ~/.codeintel/config file in your favourite text editor, most likely Sublime. Pick your language from the list below and copy paste only the blocks for the languages of your choice. Thats it. Restart your sublime, type code and press Alt + / to see the Auto completion at work. Today I came across this useful trick, which allows me to have lot of space on my screen, even though my screen supports only very low resolution. This is what I got on my machine. And following are the display names as per Ubuntu. This command has listed out other useful information as well. I could only understand the resolutions supported. Following are the resolutions supported by VGA-0 and DP-0. So the maximum resolution allowed is 1280x1024. But that doesnot allow me to have more space on screen. After long searching, I got this. This command sets the resolution of VGA-0, to 1280x1024 but it scales it by the factor of 1.25x1.25. Voila :) Now I have much bigger screen. I believe it was tricky enough for an easy problem. Many people have got atleast one wrong try. Here is how I solved it (I couldn't solve it during the contest). Here is the ideone URL http://ideone.com/g5qxYd where I tested the program with Google's inputs.